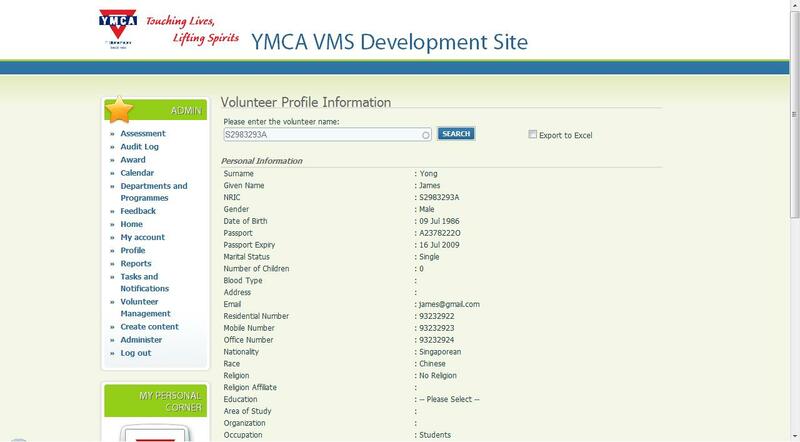 YMCA of Singapore is a Christian voluntary welfare organisation. It provides various community service programmes like education, child care, sports and recreation. It also runs a hotel in town for students. 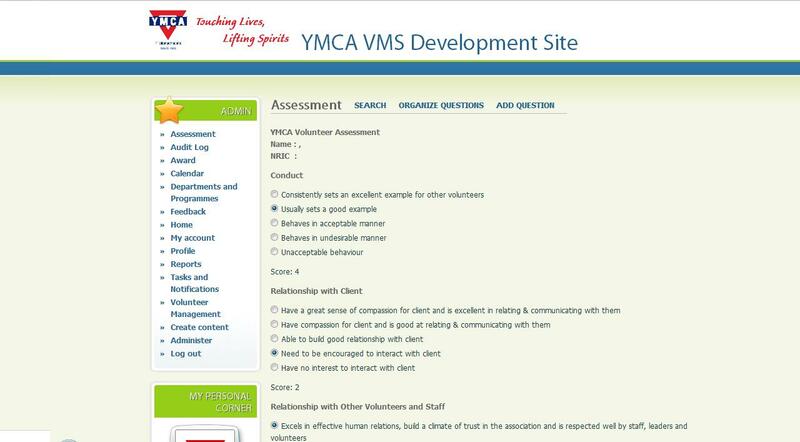 Currently, YMCA has its own Financial System, Hotel Management System, Membership Management System and has a very good set of IT equipment. However, it does not have a suitable system to manage their volunteers. There are about 3000 volunteers, participating in 50 programmes every year. In the management, there are 20 volunteer relationship officers (VRO) and 2 managers take charge of the administrative work. The system developed is the outcome of a thorough evaluation and requirement-study process of their existing systems, to pinpoint and identify an area which would most benefit from the introduction of an IT system. 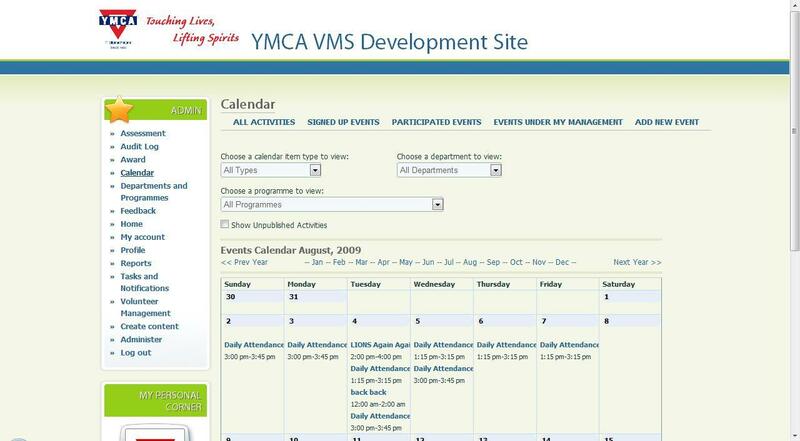 YMCA already has a few existing IT systems to support some of their key operations such as hotel management, membership management, and financial accounting. However, as an organisation with up to 3000 active volunteers, they did not have a system to assist in volunteer management. Administrative problems in this area include the inability to reliably gather statistical data, each staff keeping track of their own pool of volunteers, and the inability for other staff to follow up with volunteers to aid them in areas of personal development. Volunteers also would have no means to keep track of their own contributions and achievements. 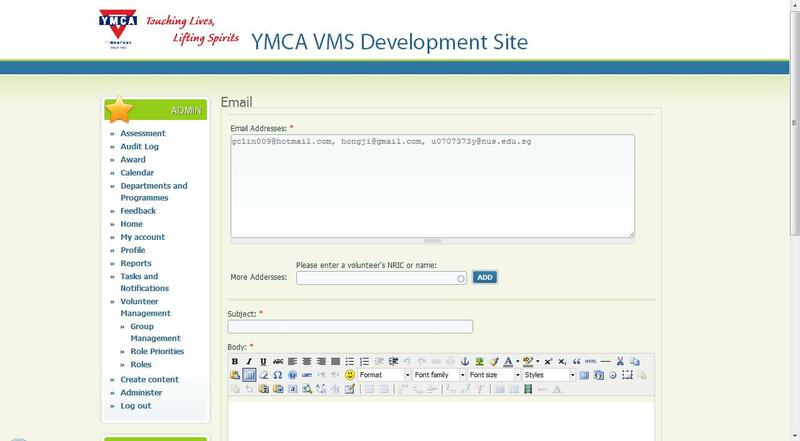 Communication between YMCA staff and volunteers is primarily over phone and e-mail to keep volunteers updated. Compared to their existing process, the new system brings about various tangible and intangible benefits. By consolidating volunteer data, the database would keep track of every volunteer’s history with YMCA, from participation to awards awarded. 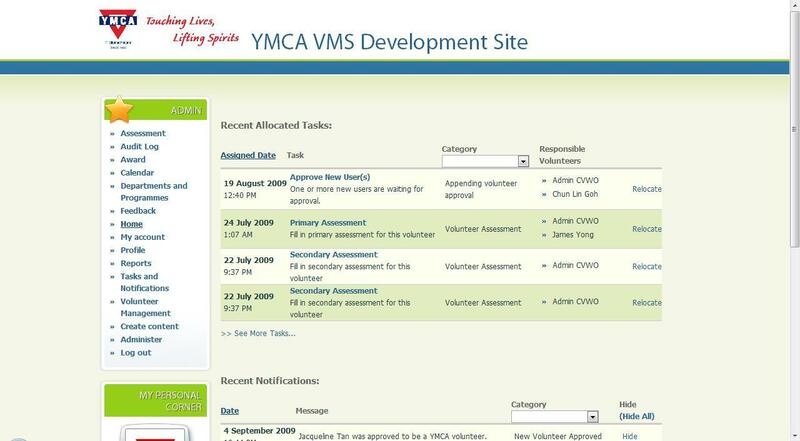 Initially, each programme department would keep track of their own pool of volunteers. This is not ideal to the upper management as they are unable to accurately gather statistics due to the presence of duplicated data, and not every department keeps track of their volunteers the same way. Volunteers would also not be able to access to information which would be useful to them such as their contribution history. Volunteer registration was previously paper-based, and volunteers could either register with individual departments or with the overall volunteer administration, which would then inform all departments of the new volunteer for them to actively engage him or her. By bringing the registration on to the Internet, this process would be automated and all related departments would be aware of the new volunteer. The system also caters to manual registration to ensure conformity. With the common events calendar, information on organised events would be available to staff, volunteers and also the public, to promote greater awareness. The process for volunteering for an event is also streamlined as there would be a common point for both volunteers to register, and staff to organise, take attendance and keep track of volunteered hours. Integration with GoThere.SG also allowed the display of localised maps, which would help volunteers find the location easily. Volunteer appraisal allows the staff to feed back, for their own records, the performance and acceptability of each of their volunteers once they clocked beyond a certain number of hours. This process is automated and the staff whom the volunteer had worked the most with would be tasked by the system to complete the appraisal. Reports can now be generated by the system at the click of a button instead of manual calculation and consolidation. The reports module allows their IT staff to add in new reports if necessary, and is sufficiently comprehensive to allow any form of reports they may require in future. This allows the system to expand beyond their requirements of today. After joining CVWO for 3 years, each project is a totally different experience working with different people. CVWO gives me a good chance to make friends from different nations and cultures. Now I started to live with Singlish, make noise on Facebook and I really enjoy that. Writing usable and friendly applications require in-depth understanding of how they think, react, expect and usage patterns of the targetted group of users. This project is not all about programming. Most of the students joining the project have strong programming background. However, we are not here just to apply our programming knowledge, but know more about the real world as well, for example, how a volunteer welfare organisation runs, how to communicate with the clients and administrative staff, and also how to manage time properly and wisely. This project is not a school assignment that you have clear milestones and well documented requirements. It requires us to think how to plan our development schedule properly so that the project will go smoothly. The success of an IT system depends on the usability and acceptance of the system by the users themselves, and thus has to not only meet their requirements but able to easily adapt to possible changes in their requirements. I have realised that foundational framework code has to be sufficient, reliable, relevant and well documented, for easy building of requirement-specific features. Development of more foundation code could result in a faster development process for future projects. We managed to deliver a customised software product in the given time frame yet the system cannot be said to be complete unless it has been put to test by actual users. There could be three ways to meet deadlines: work faster, re-rank priorities to complete important things first, or push back the deadline. While it is bad to keep pushing back deadlines, it is occasionally acceptable especially when the deadline has been placed way ahead of the actual deadline – setting aside time for emergency purposes. Our success was more meaningful in that we were devoting our time to the benefit of the society and our computing skills were rightfully served to those who are putting their hearts and souls in the community work. I realise that it is often not easy to keep up work progress especially during a tight and rushed schedule. As time passes, people tend to get tired and demoralised when they are unable to see the end. It is important to have key milestones within the entire development period so that there is always something to look forward to. Forceful declaration of “day-offs” for the whole team is important to help everyone keep in touch with reality. I really find Ten Ways to Guarantee Project Failure (or alternate link) very useful and relevant to what we’re doing. Changes during the early stage of development are easier to handle as compared to that after development is complete. Thanks to Prof Ben and Prof Damith for organizing the CCA and supervising our project. My previous voluntary experience never required such high-level intelligence and I never found a CCA in NUS that is so closely related to my major. I am lucky that I can apply my knowledge to solve real-life problem after one year’s study in the university. Thanks to YMCA for helping my hometown in the earthquake relief work last year. Tens of thousands people died in that disaster and their work helped many people to reestablish life. Voluntarism is boundless and impartial. Working in the CVWO is indeed an enjoyable experience. The most enjoyable thing is that I had the opportunity to work with the top students from different school departments. Thus, every time my friends asked me why I put so much effort into the CVWO projects, I always told them that it was because the projects were meaningful and I truly enjoyed the whole process. I came to appreciate how various voluntary welfare organizations in Singapore operate. While conducting preliminary studies in the previous December vacation, I had a chance to visit a number of volunteer welfare organisations. The fact that there are more than three hundred such organisations in Singapore astounded me in the first place. In sum, it has been a gratifying experience to witness the unique way in which CVWO operates and become an integral part in one of its summer projects. All in all, I had a good time the project. I did the right thing with the right people at the right time. In Chinese, this is called "天时地利人和". I am happy with my team and the system we have built.